We all felt really sorry about Corky’s banishment to the garage. He had given the whole family many hours of laughter, tears, and unique memories. But he was nearly grown now with his wildness beginning to dominate and motivate his behavior. He was bent on destruction in the garage which I was ambivalent about. That space was my husbands domain filled with tools, discarded items, old toys and abandoned projects. Courtney almost never threw anything away including an old mattress that he had hung up on a wall. Corky ripped a slit in the back facing the wall and made it his bed and refuge place when he was frightened. Of course his food and water bowls were regularly replenished. He actually had more room to run and more junk to investigate. The roof of the garage was open with rafters making it a favorite playground. Corky would haul selected items up and perch them there for his personal inventory. My husband also stored old half full paint cans high up the rafters out of reach for safety. Corky’s rescuer and the other older kids regularly visited him and they were welcomed into his domain but Courtney took his life in his hands every time he entered. Corky would bomb him with items from his collection then jump into his mattress safe place before Courtney could catch him. One day he pitched a can of paint down hitting his banisher on the head. Ouch! That really hurt plus the lid popped open spilling paint everywhere. This was the final insult! Courtney cut the mattress down, retrieved Corky and hauled him outside. I thought that he was going to release him to the woods but never lacking ideas he opened the door to the crawl space setting the food and water bowls inside along with the little brat and locked the door. This action turned out to be the biggest mistake. We endured several nights and days listening to Corky walking the entire sixty foot length of the house cheering with every step. Back and forth he went cheering, cheering, cheering! Finally we could not take it anymore. 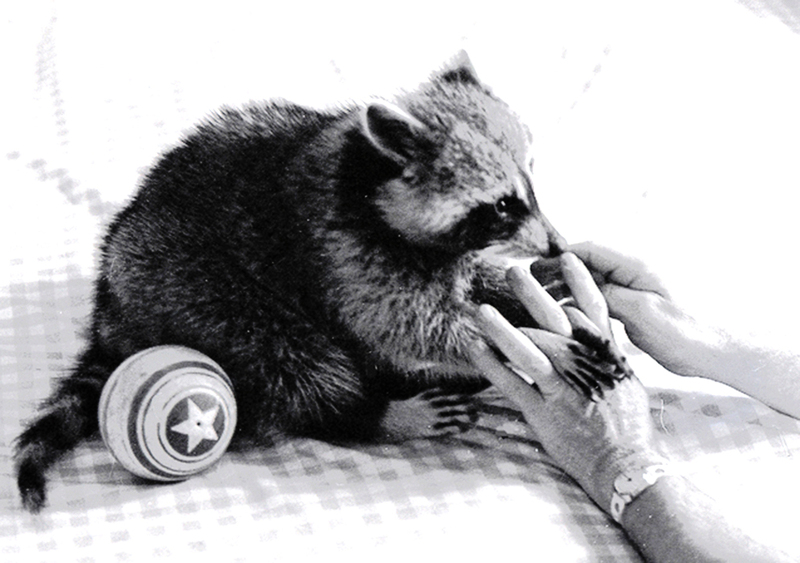 Despite our fears about releasing this domestically raised mostly pampered raccoon into the woods we had to take a chance. The door was opened and the bowls were sat just inside each day for about two weeks. One morning they were not empty and Corky was gone. We all hoped that he would find his place in his natural home and were mostly grateful for the opportunity to raise him. This entry was posted in Wild and tame animal stories and tagged artwork, human intrest, racoons, true stories, wild animals. Bookmark the permalink. Love back to you Maxima and I am glad that you enjoyed the story!